Firstly, a little bit of advice before you go, and you must go to this shop if you're ever in Barcelona: fork out the 20 odd Euros to get there by taxi. If you have a hire car, even better. We took a metro, a train and then a bus to get to El Prat de Llobregat which, it turns out, is not on any tourist guide to Barcelona, the reason being that this is part of the industrial heartland of the city surrounding the airport, its main features being large warehouses, factories and lorry depots. Plaça Reial, this ain't. After our one hour transit out of the city we tracked down the address on Citymapper in disbelief that the place actually existed, but turning a corner at the end of a row of warehouses resembling steel aircraft hangers, there it was: Pavé. And what a shop this is. If I'm ever lucky enough to have a bike shop of my own this is what I'd like it to be. This is more than a shop. It's a gallery or an exhibition centre, a monument to road cycling. Let's start with the bikes. You know how when you go to a high street bike retailer and there're rows of bikes unceremoniously lined up against each other? Here, each bike is given its own lit display case. This is more than just a piece of slick marketing or salesmanship. Javier Maya, who owns, designed and runs the place, loves the bikes, maybe even worships them, and he has taken the utmost care to display the beauty of each and every machine. The selection is well thought out and considered, and Javier has done a lot of leg work in sourcing some of the most stunning high end road frames available from Cervélo, Bianchi, Passoni, Focus and Argon, among others. Naturally, they have price tags to match the exclusive company they keep! The effect on this customer was to send shivers down my spine and the hairs prick up on the back of my neck. 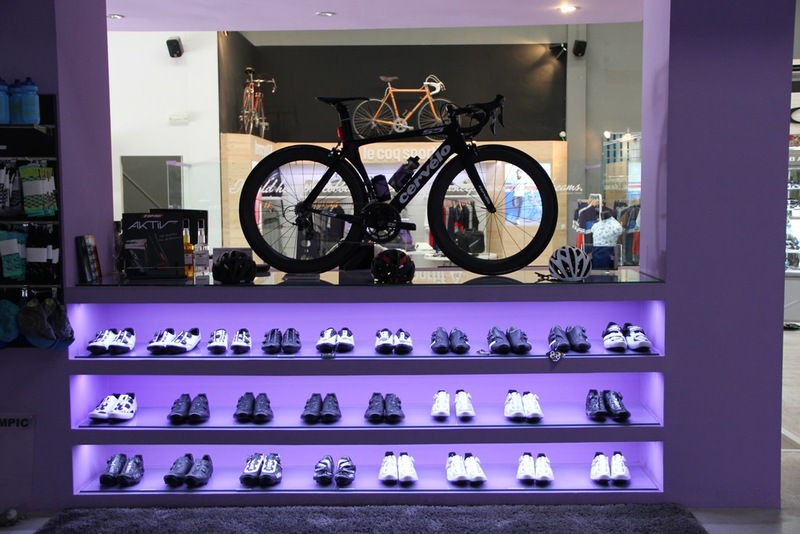 Javier's careful choices for the products he stocks are borne out in the displays of helmets, shoes, and clothes. There's a retro collection as well as the most modern fabrics and technical wear you'd find anywhere else. What stands out more than anything, though, is the exquisite eye for detail in each display as well as the tasteful products that have been sourced. Up until recently, he stocked Rapha but they now only sell online or from their own flagship store in Central London so he's had to work hard to find suitable replacements, and the Oakley range does a good job in representing more urban wear, De Marchi for retro styles, and Assos for road wear. Javier also plans to stock the Tracksmith range of clothing, a brand developed by Rapha boss Simon Mottram's former partner, based in the States. We liked the Tracksmith T that Javier sporting when we visited. So the bikes, apparel and kit are great. But the space that Pavé benefits from, by being an out of town shop, have been utilised to the full. There's a library and cafe area, and Javier is trying to encourage his Spanish compatriots who traditionally adhere to the long Spanish office hours, to come and hang out and work on their laptops in his shop. I know I would if I could! Meanwhile, the large central workshop area looks and feels like a cross between a Formula 1 pit stop and one of those trendy restaurants where you can watch your food being cooked while you sit at the bar. Pavé was named after the cobbled sections the pros have to suffer in the Paris-Roubaix, or Hell of the North as it's sometimes known, and while he's born and bred Catalan, Javier's cycling roots are deeply embedded in the French cycling culture he got to know as a student there in his youth. Despite the fact that he's set up shop in his Spanish family's warehouse, he's so much a Francophile that his Facebook posts are all in French and his two cycling clubs (one for men and one for women!) are named after French puns. Les Méchants (literally 'naughty boys') is a play on the phrase 'une soirée chaumee' or a great night out; while the girls' club is named Les Rebelles (not only rebels in the literal sense but beauties, too). If Javier is a male chauvinist or not, I have no idea - you'll have to make your own mind up about that, but he seems pretty firm about having only all-male or all-female rides in his club. Being a Méchant or Rebelle has a few benefits apart from daily local rides and trips further afield in the Pyrenees at weekends In a rather fetching purple or turquoise branded Pavé kit. You also get exclusive use of the showers (interestingly, unisex and not segregated like the rides), a well equipped gym upstairs, and an invite to a monthly dinner held at Pavé. And all for 200 Euros a year. Being a Francophile means that Javier avidly follows Le Tour, and Les Méchants and Les Rebelles like to pop over the border to watch and support as well as ride some iconic climbs. In support of Movember they stick purple moustaches on road signs when they've reached each summit, and have been known to paint huge purple moustaches on the roads of mountain stages before the peloton. Javier is more than a bike shop owner. As he puts it, "I want to sell adventures and new experiences for the members of my club and the customers of my shop." What Pavé offers is a whole lifestyle and the Méchants and Rebelles seem to live, breathe, eat and drink the Pavé dream to the full. The only thing they don't do, as far as I know, is sleep there too, but who knows what goes on after the monthly dinners?